Of course, this puts the cart a little bit before the horse. Let’s recall that in order to obtain a utility patent on an invention in the U.S. a non-provisional utility patent application must be filed. A utility patent is different from a design patent. A utility patent will define the structure of an invention, as well as the way it operates. A design patent merely protects the way a product looks, or in patent speak the ornamental appearance. While design protection can be quite important for certain inventions, and many inventors pursue both design and utility protection, utility patent protection is much stronger and typically the type of protection most inventors will elect to pursue. The rights ultimately granted in a utility patent are defined by the patent claim (or claims) reviewed by the patent examiner and ultimately issued in the patent. While the specification (i.e., text and drawings) patent application must define the invention in its full glory, if you do not have claims covering a particular aspect of what you have disclosed then you have not been awarded those rights. Thus, the claims are frequently described as the most important part of the patent application because they are said to define the scope of the exclusive rights granted by the government. Patent claims are difficult to read and even harder to write. The complexity of patent practice is why many (if not most) inventors will seek professional assistance from a patent practitioner, and the patent claims are the part of the application that are the most technically complicated. A nonprovisional patent application must have at least one patent claim particularly pointing out and distinctly defining the invention, although most patent applications and issued patents will have many more than one claim. For the basic filing fee you can have up to three independent claims and up to twenty total claims without incurring any additional claim fees. Because a patent with more claims is considered stronger and more valuable as a broad general rule, you might as well have at least as many as you can for the price of the basic filing fee. A claim may be written in either independent or dependent form. An independent claim stands alone and does not refer to or incorporate any other claim. A dependent claim refers to a previous claim and further limits the invention, either by incorporating an additional element or limitation not previously introduced or further narrowing an element or limitation that was previously introduced. A claim in dependent form incorporates by reference all the limitations of the claim to which it refers. Second, every patent claim needs a transition. ** The most common transitions are: “comprising” and “consisting of.” “Comprising” is by far the most common because it means the invention includes but is not limited to the elements identified in the claim. “Consisting of” is closed and means that the invention is only what is described. Generally speaking, you see “consisting of” as a transition in the chemical, biotech and pharmaceutical arts, or more broadly in areas where the technology is highly unpredictable. *** For mechanical and electrical inventions, software and methods, you will almost universally see “comprising” used because it will result in the broadest protection. Third, the first time you introduce a limitation (i.e., an element, characteristic, internal reference, etc.) in a patent claim you MUST introduce it with either “a” or “an”, as is grammatically appropriate. (i.e., Primary antecedent basis). Subsequently you refer to the already introduced limitation by either “said” or “the.” (i.e., Secondary antecedent basis). This can be quite difficult for beginners because the three most common words in the English language — a, an and the — are all terms of art for patent claim drafting. Below in an example of an independent claim that applies the above stated three simple rules, which is taken from U.S. Patent No. 6,009,555, titled Multiple component headgear system. I have put the preamble in a red box, the transition in a blue circle, and I’ve bolded and underlined the primary and secondary antecedent basis. I’ve used “said” in this example. The word “the” could have been used, but for those starting out “said” is probably best because it is a little more forced, which will hopefully help you make sure you applying this rule properly. Illustrative independent claim 1, which is inspired by U.S. Patent No. 6,009,555. Below are examples of dependent claims, again using the invention found in the ‘555 patent as our guide. Once again, the preambles are in red, the transitions are in blue, the antecedent basis are bold and underlined. There are a couple things to notice, however. First, for dependent claims the preamble must match up with the preamble from the broadest independent claim in the chain. Here the invention is a headgear apparatus, so all of the dependent claims will be to a headgear apparatus. Second, the transition for a dependent claim will either be “wherein”, which is used when something already introduced is being further narrowed, or “further comprising” when something new is being introduced for the first time. 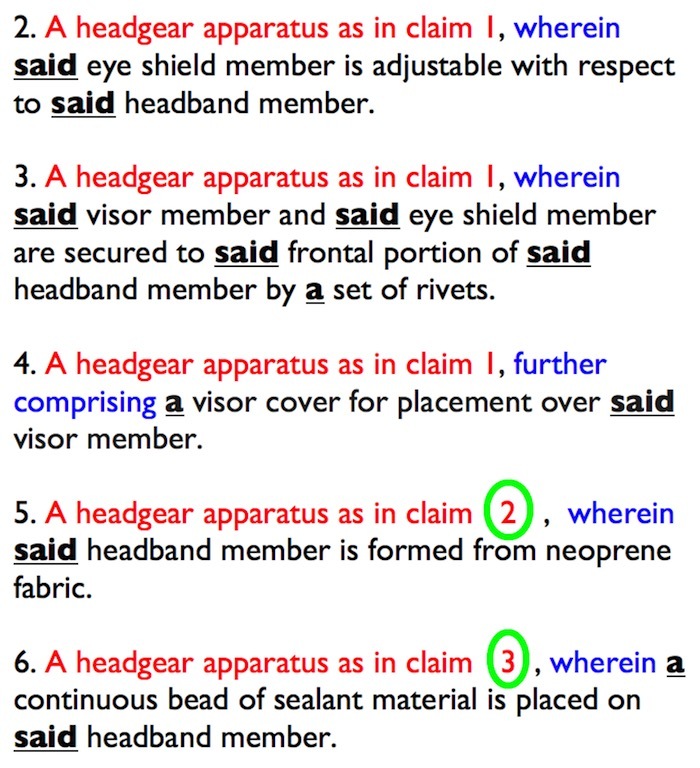 Third, notice that claims 5 and 6 do not depend from claim 1, but rather dependent from other dependent claims. This is how you chain claims together. Finally, If you look at the patent you will notice this is not the order of the claims. There is a technical mistake in the order of the claims as issued in the patent, which could be raised by an examiner but typically is not any more. You are supposed to have all claims that depend on claim 1 before you have any claims that depend from claim 2 and so on. If you look at the ‘555 patent you will see that our dependent claim 4 corresponds with issued claim 8, which would lead to a Rule 1.75(g) objection if you do that in your application. Illustrative dependent claims inspired by U.S. Patent No. 6,009,555. UPDATED on Tuesday, December 13, 2016, at 2:42 pm ET to add the comment found below at **. ** A preamble and transition should be thought of as absolutely required unless you are claiming a new compound or synthetically created element. For example see U.S. Patent No. 2,699,054 (particularly claim 2), which covers tetracycline. Also see U.S. Patent No. 3,161,462, which covers Element 96. It is the extraordinary situation where claims will not have a preamble and/or a transition. See alsoMPEP 2173 (t). *** A full explanation as to why this is true goes beyond the scope of this article. Suffice it to say for now that when you use “consisting of” as a transition you narrow the universe of possible prior art. Additionally, in unpredictable fields this can be useful because you want to claim what you know works and not capture too many things in your claim that will not work, which could render the claim invalid. It would be stoop8 not to have a transition (comprising or consisting essentially of) but it would not be impossible. Yes I know, 112 indefiniteness. True, but there are exceptions. See claim 1-8 of US3161462 for a rather extreme example. As I explain whenever I teach patent bar students, the rules are the rules and what you will be tested on. The fact that some examiner will ignore the rules and let you get away with something that is not allowed doesn’t mean that the rule is not the rule. So please, be my guest and write your claims without preambles and transitions. But for those who don’t want to have their claims rejected and objected to you will include a preamble and a transition in every claim. Hoping that an examiner will allow a claim without a preamble and transition is stupid. Expecting a claim that has issued without a preamble and a transition to remain valid upon challenge is even more stupid. Well let that be a lesson to your newbie patent law students here of how persnickety the law can be. There is a difference between absolutist words like “need” “must” “shall” and less rigorous words like “should”. I suppose I should have written it saying that unless you are a Nobel Prize winning level independent inventor working in your garage you must have a preamble in your claim and you must have a transition. Interestingly, this article comes from a slide deck prepared years ago in cooperation with the United States Patent and Trademark Office. For me, when teaching newbies, if you need to do something in 99.9999999999999999 percent of cases I’m comfortable saying that asymptotically approaches 100% and I’m comfortable with how I characterized the rule. I’m sure I could look up the applications you file I wouldn’t find any examples of claims without preambles or transitions, but I get it. What I said is only right in 99.9999999999999999 percent of cases and clearly that is not always. So please, go ahead and file claims without a preamble and without a transition. I’m sure that is a wonderful strategy! I just ask you report back and let us know of your great and glorious success with that strategy. I would explain the issue differently. Element 96 is well understood physicist terminology that implicitly expresses patentese idiom as follows. An expert would affirm that “Element 96” is tremendously clearer to a PHOSITA than the patentese form of the claim. Gene should have stood his ground. All patents have preamble and transition, but in certain technological arts the preamble and transition can be subsumed into well understood domain specific nomenclature, abbreviations, or (even) diagrams. Patent practitioners must have at least some non-legal technical knowledge. I long ago stopped using any preambles other than the broad classification: apparatus, process, system, composition,or manufacture. Too often in litigation the preamble comes back to haunt. Here are 1 word claims from US3775489. The individual words are all domain specific terminology that subsumes the patentese preamble and transition. A pure patentese form of the claim would be far less clear to a PHOSITA than the one word domain specific language. We find a similar situation in the tetracycline patent. What rejection or objection to the claim could the examiner make for lacking a preamble or transition phrase? What section of 35 USC requires a claim to have either? You’re comfortable with how you characterized the rule? What rule is that? Here is the rule for a chemical formula in a claim. Claims to chemical compounds and compositions containing chemical compounds often use formulas that depict the chemical structure of the compound. These structures should not be considered indefinite nor speculative in the absence of evidence that the assigned formula is in error. The absence of corroborating spectroscopic or other data cannot be the basis for finding the structure indefinite. See Ex parte Morton, 134 USPQ 407 (Bd. App. 1961), and Ex parte Sobin, 139 USPQ 528 (Bd. App. 1962). A claim to a chemical compound is not indefinite merely because a structure is not presented or because a partial structure is presented. For example, the claim language at issue in In re Fisher, 427 F.2d 833, 166 USPQ 18 (CCPA 1970) referred to a chemical compound as a “polypeptide of at least 24 amino acids having the following sequence.” A rejection under pre-AIA 35 U.S.C. 112, second paragraph, for failure to identify the entire structure was reversed and the court held: “While the absence of such a limitation obviously broadens the claim and raises questions of sufficiency of disclosure, it does not render the claim indefinite.” Chemical compounds may be claimed by a name that adequately describes the material to one skilled in the art. See Martin v. Johnson, 454 F.2d 746, 172 USPQ 391 (CCPA 1972). A compound of unknown structure may be claimed by a combination of physical and chemical characteristics. See Ex parte Brian, 118 USPQ 242 (Bd. App. 1958). A compound may also be claimed in terms of the process by which it is made without raising an issue of indefiniteness. I am taking the patent bar exam on Dec. 27 and am studying for the exam by means of the PLI patent bar preparation course. One of the post course sessions goes over patent 5,402,728 which has the following claim. (c) initiating means for initiating said phase change within said actuating means. 2) “said larger volume causing a pressure build-up within said cavity”. Nominative absolutes provide attendant circumstance to the verb, which in this case is “claim” from the phrase “I claim”, which precedes the list of claims. Because the nominative absolute construction can be construed to have temporal, causal, conditional, or concessive force, the construction is inherently ambiguous even if not indefinite in BRI sense. Nominative absolutes can be painful to translate into other languages. A “wherein clause” provides further delineation of a limitation, and from the grammatical standpoint “wherein” is equivalent to the prepositional phrase “in which” and the antecedent of “wherein” should be the noun phrase to which the claim is directed. In this case the noun phrase is “a releasable attaching apparatus”. When I write claims, I prefer to put a list of “wherein” relative adverbial clauses after the recitation of the limitations (thus at the same grammatical “nesting level” as the transition that also modifies the noun phrase to which the claim is directed). I then place the last of nominative absolutes after the relative adverbial clause list. Because the nominative absolutes modify the verb that precedes the claim list, the nominative absolutes are at the next lower grammatical “nesting level” in relation to the list of relative adverbial clauses. The claim writer was not as precise with respect to grammar as I am. I would have written the claim as follows. I eliminated the nominative absolute and the “wherein” clauses because they seem more appropriate to dependent claims. In the above formulation, the relative pronouns of the relative clauses show the correct intended relationship of modifier and modificand — something that should be immensely useful in any infringement trial. I do not deny that nominative absolutes can be useful in claims. I only prefer to avoid promiscuous use of them and to employ them only in circumstances where possible ambiguity is minimized. Nominative absolutes might also be useful in introducing claim specific terminology and definitions, but I have never seen them so used. In case readers have not guessed, I am building an automatic claim parser to assist in clarifying what a claim will mean to a grammar-aware judge in an infringement trial. An automatic claim parser that produces a clear modifier-modificand chart may also help during a Markman hearing and in persuading a jury of the validity of an infringement complaint. I meant “the list of nominative absolutes” and not “the last of nominative absolutes”. I’ve amended the article to take into account the comments. Obviously, it is possible to have a claim without a preamble and a transition if you claim a compound and/or a synthetically created element. If anyone has any other examples I’ll amend the article further. As for whether I’m comfortable with saying a claim needs a preamble and a transition, I am. That is how claims are written. To suggest otherwise is to look for the extreme exception and then attempt to make that extreme exception into the rule by suggesting that a claim body would be definite enough without any context. Earlier in the thread In In re Fisher is used as an example, but that example includes a preamble and a transition. “polypeptide of at least 24 amino acids” would be the preamble and “having” would be the transition. See MPEP 2111.03. I suppose one lesson from the exchange to the audience that you were aiming at is that patent law can be complex, and exceptions abound. Like other areas of complex law, there are definitely traps for the unwary. I am drafting a provisional patent for something that, relative to the examples given, is so big I struggle to know how to deal with the translation to minutia, or if I should even try. This is akin to inventing a car if all we had is motorbikes. Sure some people did put extra wheels on their wheelbarrows and motorise them, and others did build passenger jets without wings and put wheels on them, which is the kind of prior art around, but nobody looked at it from the perspective of mass transport of a population. Not quite, but sufficiently illustratively for the purpose, I am trying to patent a car in the modern era where lots of the bits exist but just never assembled as a 5 person personal transport device. Do I just patent an aerodynamic box with doors, 4 wheels and a method to propel and steer them? which could be anything from lightweight kevlar boxes that are self propelled to the biggest stonker of a boat engine or anything in-between. I am not meaning to ask for advice as I don’t think that is what you want to do here, just point out that people with big ideas have a heck of a lot to wade through, and even how to approach the whole patent task when that is where you are coming from is pretty opaque. It needs to be knocked down to bite sized chunks, but if I was patenting a car I could easily write a few hundred claims as I would have ideas about how each of the sub-systems should be done, and able to claim them widely enough that I could intend for example to use mechanical, hydraulic and electric power assisted steering – which took the real inventors some decades to get through that set of developments. I already know a lot about the pathway of where I will be taking this thing, despite that much of it is just conceptual ideas in my head. Could write many pages describing this, but as you point out, the practical execution of the protection all comes down to the claims so I am starting there. Love some tips! All very confusing? What I will actually be doing is submitting a provisional patent application in the coming week then I have a year to get the funding together for the first major roll-out, which WILL include having a patent lawyer assist with the filing of the formal patent. I am also going to try asking for a pro-bono patent review of the provisional before submitting it, which if it can happen might get better protection. Eventually the story will turn up on http://www.vrdriversim.com, there is a teaser there now. All this adds up to I am pretty keen to read your further thoughts on advanced claim strategies – any chance you will be getting that one out any time soon? Thanks again for all that you have done in this space. I will try and circle back with more on method claims over the next couple weeks.